Have you had tabbouleh salad before? If you’ve been to a Mediterranean restaurant, chances are you’ve had tabbouleh as it is by far one of the most common Middle Eastern salads. It is such a simple salad yet so fresh and delicious. 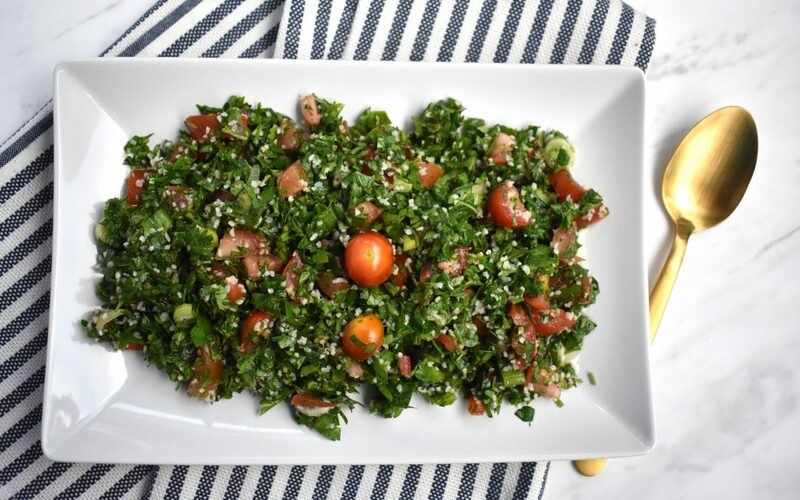 It’s a personal favorite of mine, and in today’s post I wanted to share the authentic tabbouleh salad recipe. I have seen so many variations of this salad online, but very few show the authentic way of making tabbouleh. I’ve also noticed that most tabbouleh at markets and restaurants has way too much bulgur in it, which is not the traditional way of making tabbouleh. The recipe below is the way my mom makes it, passed down to her from generations. 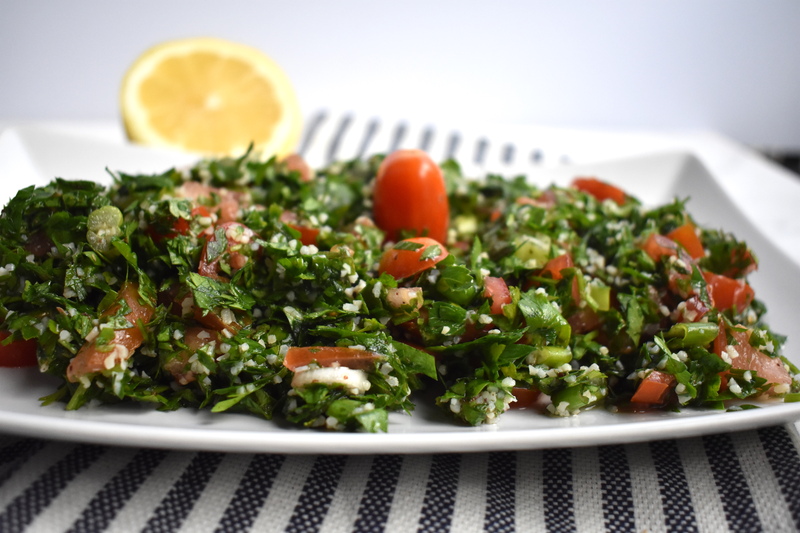 The main ingredient of tabbouleh is parsley. Parsley is a bright green herb very common in Mediterranean cuisine. It adds a lot of flavor to meals and is used as a garnish in many dishes. There are two varieties: curly and Italian. 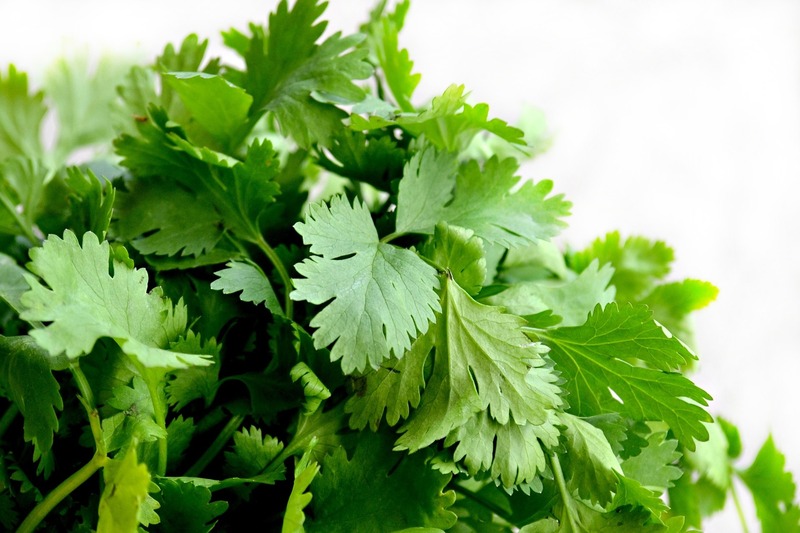 They may be used interchangeably although curly parsley is often used for garnish. Italian parsley has flat-leaves. Consuming parsley has many health benefits. It has very high levels of a flavonoid called apigenin. Flavonoids are antioxidant compounds found in plants that have been associated with decreased risk for cancer and cardiovascular disease. Research on apigenin has been shown to have a protective effect on breast cancer. Parsley is also high in vitamin K, vitamin A and vitamin C.
To clean parsley, you can plunge the parsley bouquet in a bowl of water or hold it under running water. To chop the parsley, first re-group the leaves together in small bouquets so that it’s easier to hold and you don’t have any of the large stems. Then, place on cutting board and start to chop them finely. An essential ingredient to tabbouleh is burghul. Burghul is a whole wheat grain that is cracked and partially pre-cooked. It’s similar to cracked wheat, however cracked wheat is uncooked. Since burghul is partially pre-cooked, it is quick to prepare. There are different varieties of burghul: fine, medium, and coarse grain. Fine grain is used to make tabbouleh. Burghul is very high in fiber, with 1 cup of cooked burghul providing 8 grams of fiber. It also contains B vitamins. To cook the burghul, place it in a bowl with water and let it soak for 10 minutes. The burghul will absorb the water and become soft. This authentic Middle Eastern tabbouleh salad is fresh and delicious. Chop the parsley (see directions in blog) and place in a bowl. Finely dice the tomatoes and add to the parsley. Chop the green onions (white and green part) and add to the parsley. Cook the burghul by placing it in a small bowl with water for 10 minutes. Strain any excess water then add it to the salad. Make the vinaigrette by mixing the olive oil, lemon juice, salt and dried spices. Drizzle over the salad and mix well.